With that being said, December brought to close a solid year in terms of the Total Employment Gap. The unemployment rate remains in the high 6 percent range, but labor force participation is increasing and those working part-time but want full-time work is slowly declining. The Total Employment Gap closed nearly 2 percentage points in 2014, the best year so far in recovery, but the state still is just about 60 percent of the way recovered. On the monthly jobs figure, December’s gain of 8,200 seasonally adjusted along with strong October and November figures makes the 3 month average the best on record according to our friends over at Employment. Good news, no doubt. However our office has some very technical concerns about these numbers. In particular the seasonal factors used by the Bureau of Labor Statistics, which presets the monthly seasonal factors a year or so in advance. 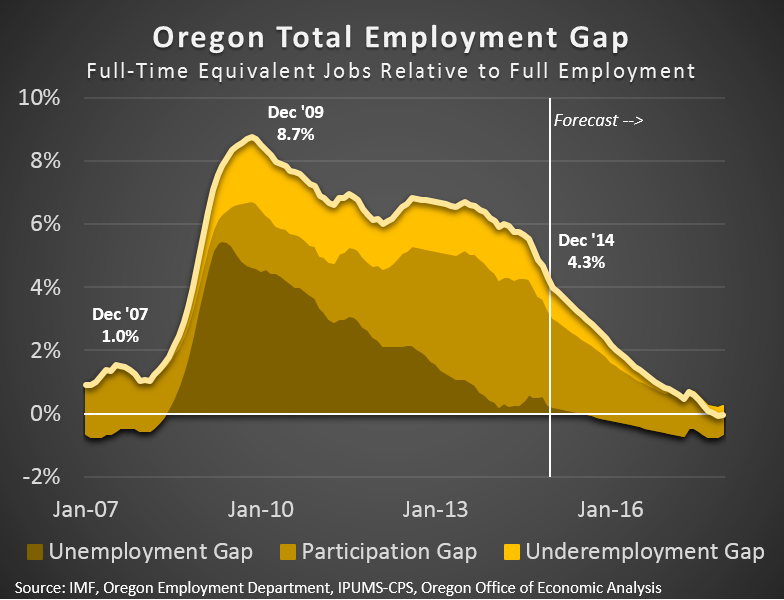 For a recent example, think back to June when the preliminary estimates said Oregon lost 4,300 jobs over the month and everyone freaked out. Well June’s revised (and preliminary benchmarked) data shows gains of 1,500 jobs. At that time our office pointed out that the seasonal factors did not make sense and it was highly unlikely the state lost that many jobs. Today we’re talking about the reverse of that. No doubt the economy has improved, and job growth has picked up. However the headline monthly employment numbers are likely overstating the growth purely due to the seasonal factors from BLS. To try and make this clear, below I show the job gains over the past year from both the not seasonally adjusted data and the seasonally adjusted data. The differences here work out to over 500 jobs per month. These numbers should be the same, and after annual revisions and benchmarking, they will be. However in real time the data do differ, due to the preset seasonal factors. The story isn’t these technical issues. Let me make that clear. 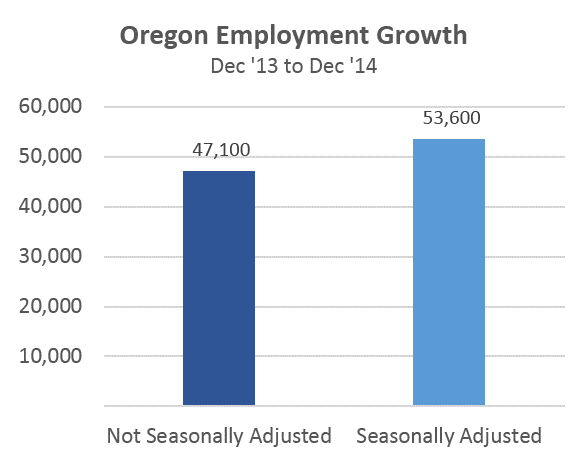 However, don’t be surprised that once revisions are taken into account Oregon saw good, strong job growth to end 2014 but maybe not quite record setting. All told, 2014 has been a good year for the economy and labor market. Much progress has been made as the state has finally regained all of its lost jobs due to the Great Recession, middle-wage job growth returned and the like. Our office expects 2015 to more of the same, with some expectations for better wage growth as well. Has there been any change in the relative numbers for the “Less than 1 in 10” and “About 1 in 3 Regained” counties that were demonstrably weaker in their recovery as displayed in the “Share of Lost Jobs Regained by July 2014” chart that came out last Fall? Thanks for the question. So far not too much change along those fronts, as it takes a long time to recover even if trends are strong. We should have a few more counties (Yamhill, Deschutes getting close) further along. Will update that for our forecast in a few weeks.